The horse in Troy, and Jelen (Deer) in Sremska Mitrovica! On Saturday in the central city square, Apatinska brewery organized a spectacle to remember for the citizens of Sremska Mitrovica! 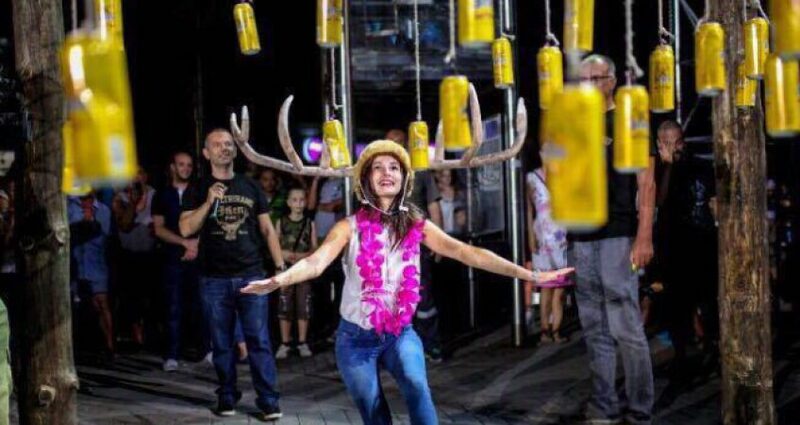 The promotion of Jelen unfiltered beer grew into a huge gathering, singing and competing in unusual and previously unseen games. On Friday, a wooden structure on the Ćire Milekića Square was becoming bigger and bigger. While an unusual object provoked the curiosity of passers-by, the groups of “Trojan warriors” moved into action inviting the citizens to the event on Saturday. It became clear that something extraordinary would happen, and so it was – on Saturday 27 August, in the early hours of the morning, a giant wooden deer in its full glory was revealed, 8 meters high, and 4 meters wide! Successfully tackled challenges “unlocked” the impressive structure just after 21 pm and brought the biggest surprise of the night – Jelen beer Unfiltered, ensuring that this promotion will be remembered for being unusual and creative. Jelen Unfiltered is our Jelen which did not go through filtering process, with natural ingredients that last longer, giving it a visible cloudiness and fuller taste, while a shorter shelf life provides it with greater freshness. Jelen Unfiltered is pasteurized lager beer with 5.2% alcohol and 12% malt extract.